We are so excited today to kick off our 30 Day Business Blog Challenge! Yes, even on a Sunday! 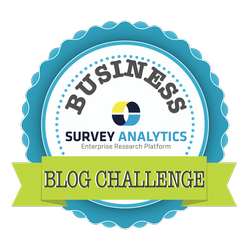 Our blog challenge is designed to help both your business and ours become better bloggers, increase traffic, engagement and get in the habit of making great unique content moving forward. We are all about empathy, partnership and being both helpful and resourceful to the bottom line of everyone we work with. Plus, if you complete the challenge we will throw you a $50.00 Amazon.com gift card and spotlight you on our blog, too! The first blog post of the challenge is to share five quotes that define your brand. We chose this topic for day one because blogging for 30 days in a row is a big commitment, just like truly understanding your business is. Before we dive into the other topics, we want to kick off and hear why you do what you do and the inspiration behind it all. It’s important to understand your brand first and business second. If your team doesn’t understand the brand, how will they explain it or be able to help your customers or sell to new prospects? Ask your company leader or an executive for some quotes that define your brand. Quotes do not have to be your own, either. Share what inspires and lies down the foundation of your brand. These quotes we selected to share are words right from Survey Analytics President Vivek Bhaskaran during a recent boot camp for our entire company as well as some of our newer team members that focused on sharing our brand, company culture and why he started our company in the first place. "You help your business listen and you will win. Let us help you and we will all win." "Survey software is just one thing in the big picture of listening. We go way beyond." "We know we can solve your project requirements, but so can anyone else. 60% of the decision process is about feeling comfortable." "We're in this together. We believe in building a strong, long-term partnership, contributing to the growth of your business." "Trying out new ideas shouldn’t be frowned upon. If everything works, you’re not pushing the envelope."